This one plant was selectively bred over hundreds of years to create dozens of wildly different vegetables. By selecting and breeding plants with bigger leaves, or larger buds, the various cultivars were created. 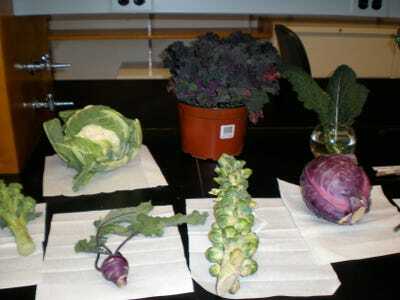 The Botanist in the KitchenSeveral Brassica Oleracea cultivars on display. Red, green and savoy cabbages were created from a kale cultivar (likely the European collard greens) in the 1200s by selecting for a large terminal bud — the growing end at the top of the plant. The leaves are tightly wound around a short, wide stem (the cabbage’s core). Brussels sprouts are like tiny cabbages, except they grow from the buds along the plant’s stem. They first hit the scene in the 1200s as well. Kohlrabi was created by selecting for a thicker stalk in a kale plant around the 1400s. Chinese broccoli, another subspecies of B. Oleracea, was domesticated in China and is distinct from broccoli, which was created from a kale predecessor in the 1500s. Broccoli was developed by selecting for the larger flower clusters, which are then harvested before they bloom. Cauliflower was developed from one of hundreds of broccoli varieties. 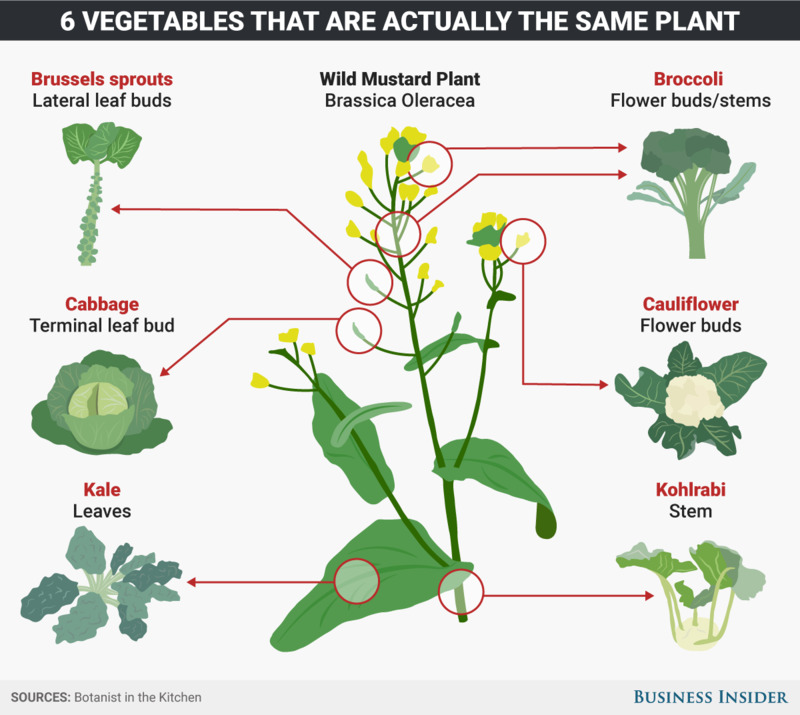 The amazing evolution of Brassica Oleracea goes to show that humans have been tinkering with the genetics of our food — creating what are now known as genetically modified foods, or GMOs — for a very long time. New lab techniques just let us do that in a more precise and directed way. Jen Welsh worked on a previous version of this post.